Like many Americans on Monday night, I sat on my couch eating a plate full of food while watching The Ohio State Buckeyes dismantle the Oregon Ducks’ explosive offense. I sat and watched Ohio State running back Ezekiel Elliott run around, behind and through Oregon defenders. I sat and watched the “12 Gauge,” Ohio State’s third-string quarterback Cardale Jones, launch bullets into the arms of Buckeye wide receivers all night. I sat and watched Ohio State force the Ducks’ offense to go three-and-out for the first time in what seemed like years. I sat and watched, die-hard Buckeyes and Ducks fans sat and watched, casual football fans sat and watched and, most importantly, the NCAA sat and watched. Instead of eating a plate full of food as many of us did –– although I’m sure the NCAA had its plate full –– the NCAA counted its money while it sat and watched, the same thing it does while it sits and watches student-athletes abandon their degrees in the hopes of becoming professional athletes. In theory, the idea sounds great. You come out of high school straight into the national spotlight, earn recognition in your sport for a year or two then leave school and make millions in the pros. What could go wrong? According to a study conducted by the NCAA itself, only about 0.38 percent of college football players will be drafted into the NFL. If undrafted players are included, the odds don’t get much better, as only about 1.7 percent of college football players end up playing in the NFL. But football’s a tough sport to play. What about other major college sports? How many of those kids actually make it to the pros? According to the same NCAA study, only 1.2 percent of college basketball players make it to the NBA, only 1.3 percent of college hockey players make it to the NHL, only one percent of college soccer players make it to the MLS and only 0.9 percent of women’s basketball players make it to the WNBA. The NCAA uses the example of coming and going through college in only one or two short years before earning millions of dollars professionally as a way to convince high school students to add the “-athlete” part of student-athlete to their experience. As the study shows, however, a very minute slice of student-athletes –– the elite of the elite –– actually has the ability, good fortune and opportunity to follow that example. Everyone else who tries and fails? They’re left searching for something to do with their lives with no college degree, often with limited financial resources and rarely with any support from the NCAA. In other words, the elite of the elite continue to rise in the NCAA’s currently advertised plan for student-athletes. Of course, the NCAA doesn’t want to give the impression that it doesn’t care about its primary money-earners. So what does it do? The NCAA’s website has a page titled “Student-Athlete Benefits” on which it lists financial support for certain achievements or setbacks. For example, the NCAA will provide additional scholarships, grants and internships to student-athletes who complete their degrees. The website also lists drug testing as a benefit provided for student-athletes. This is the same drug testing that prevented Oregon’s star wide receiver Darren Carrington from playing in the national championship game against Ohio State. The NCAA has an overly punitive policy on cannabis consumption in place when compared to other sports’ policies. According to an NCAA spokesperson who was referenced by Bleacher Report, the NFL’s threshold for a positive marijuana test is 35 nanograms of THC, the main ingredient in marijuana. The MLB’s threshold is 50 nanograms and the World Anti-Doping Agency measures for 150 nanograms. The NCAA’s minimum needed to return a positive drug test? 5 nanograms. 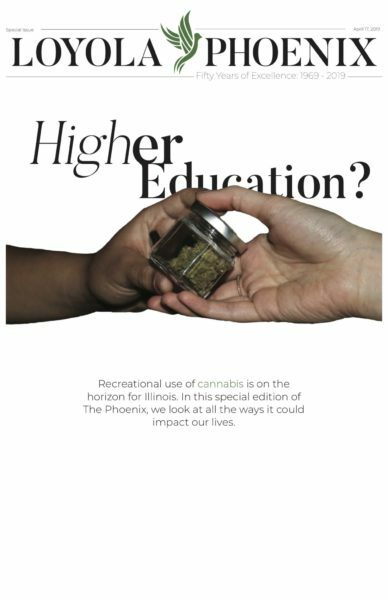 If the NCAA were to spend as much time setting policies about degrees for student-athletes as it does regulating a substance that is already legal for recreational use in two states and counting, would players stay and earn their degrees? Well, why not? As a student in 2015, I realize first-hand that people my age, myself included, don’t always take advice and do what we’re told. Student-athletes aren’t going to take the advice of staying in school, and the NCAA knows that. As long as millions of dollars are being dangled in front of 18-, 19- and 20-year-olds, they’re going to keep making the jump to the pros before earning a degree. What the NCAA can do is set regulations about earning a degree before making an attempt to be a professional athlete. Instead of college football players being required to play two years before declaring for the draft, why can’t the NCAA require the players to earn a degree? Not only will the student-athletes have degrees at their disposal should they fail to make it as a pro, but the players will also have more time to learn their sport. Instead, what’s the NCAA doing? It’s sitting and watching, just like the rest of us.